The Center for Social Concern at Johns Hopkins was created in the early 1990’s as the community engagement center for the Johns Hopkins University Homewood campus. 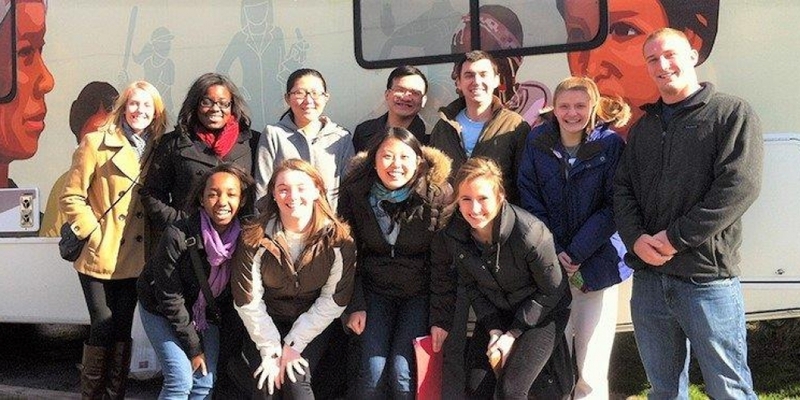 The Center offers students the opportunity to connect and become more involved with organizations in our Baltimore community. The Center for Social Concern at Johns Hopkins University was created in response to increased interest on the part of Hopkins undergraduate and graduate communities, hearing a deepening call to community change and development. The Johns Hopkins University’s interest in community issues harkens back to its first president, David Coit Gilman. His inaugural address called for higher education to “make for less misery among the poor, less ignorance in the schools, less bigotry in the temple.” More than one hundred years ago, under Gilman’s presidency and guidance, the Johns Hopkins Charity Organization Society (COS) was formed to advance that ideal. A few years later, Eugene Levering financed the building of Levering Hall, to be “dedicated to the spiritual education of the young men of Johns Hopkins” – an all male institution at the time. Gilman’s COS formed a natural partnership with the Levering Hall YMCA. Through study and service they would engage in what would be today’s “action research” in addressing the needs of Baltimore’s low income communities. Social welfare and the academy had taken root as a co curricular mission of the university since the nineteenth century onward. During the struggle for civil rights in the 1950s and 1960s, Levering Hall became the campus center for action and reflection on what it meant to live in a racially divided society. Out of a sense of social responsibility, the Johns Hopkins Tutorial Project was created by then chaplain Dr. Chester Wickwire, and to-date it continues its work in Levering Hall. The YMCA and its chaplain created more than fifty tuition-free courses for the community, high school equivalency programs in the Baltimore City Jail, and cross-cultural opportunities for JHU students to interact and work with the citizens of Baltimore. In the early 1990s, the Office of Volunteer Services was funded and staffed by the dean’s office, incorporating some of the programs begun through the YMCA chaplaincy, and adding others. An ethic of service and commitment at Johns Hopkins evolved from the Office of Volunteer Services toward the establishment of the Center for Social Concern. Faculty, students, and staff continue to work towards a deeper sense of responsibility and citizenship through engagement. The Center serves as a focal point on campus for these social concerns, as they became defined in the community in tandem with campus stakeholders. Originally based in Levering Hall, just as the service initiatives of Gilman, Levering, Wickwire, and others for more than a century, it’s the hope that the Center for Social Concern will reflect both in spirit and in substance the legacy of these visionary leaders. The Center for Social Concern emphasizes the value of service with others, rather than the commonly accepted concept of service to others. The volunteer and client enter into an educational process where both benefit from the interaction and reciprocal learning is the common ground for all of our initiatives. Our programs and efforts are striving to create a “better community” in and around the Johns Hopkins campus. In summer 2009, CSC’s main facility moved from Levering Hall to 3103 North Charles Street (called the Center for Social Concern Building). This three-story home houses CSC’s staff, programs and student services, except for the Johns Hopkins University Tutorial Project, which is located on the second floor of Levering Hall. The Tutorial Project’s location is unique in that the main area of the space contains an incredible floor-to-ceiling mural done by Robert R. Hieronimus, Ph.D. “The Apocalypse” was commissioned in 1968 by Dr. Chester Wickwire, then-Chaplain of the Johns Hopkins University. video of the center for social concern's 25 year accomplishments. shows pictures of students, staff, partners, and faculty over the past 25 years beginning in 1994 to 2017. The Center for Social Concern celebrated 25 years of engagement with our community in 2017-2018! We would not have been able to reach this milestone without our dedicated and supportive students, community partners, alumni, staff, and faculty. To kick off the celebration, in April 2017, the Center for Social Concern invited all of our community partners, alumni, students, faculty, staff, and friends of the CSC to join us and celebrate 25 years of accomplishments, partnerships, and engagement with our community! The celebration was held during Alumni Weekend on Friday, April 21, 2017, from 4-6pm in the Glass Pavilion, Levering Hall. Read more about the celebration.